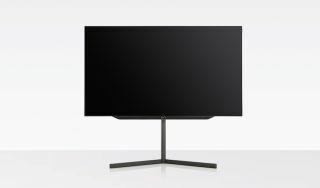 Loewe adds 77in model to its Bild 7 OLED TV range | What Hi-Fi? Loewe launched its Bild 7 range back at IFA 2016 with two size options: 55in and 65in. The latest addition, Bild 7.77, takes the size options up a notch. This 77in set is one of the largest OLED TVs you can buy (alongside the 77in version of LG's W7 'wallpaper' OLED). The new Loewe offers 4K resolution from a screen that's only 9mm thick. There's full support for all the main flavours of High Dynamic Range (HDR); HDR10, HLG and Dolby Vision. Audio is supplied by a 120W built-in soundbar that hides away when powered down - but in keeping with Loewe tradition, the TV can also be hooked up to the company's speaker solutions, such as Klang 5. The inclusion of Bluetooth allows you to stream music to the TV directly, or you can switch things around and beam the TV's audio to a pair of Bluetooth headphones for late-night listening. Loewe options include a wall mount, and motorised table and floor stands. You can even choose between dark or light grey fabric covers to hide any cables. Naturally, the bigger the screen, the bigger the price tag - if you want a Bild 7.77 it's going to cost you £12,990.